Gîte équipée et modernisée à la frontière entre la Normandie et la Bretagne. Située au fond d'une paisible route de campagne, à seuelement 30 min de la côte. La Basse Lande est un cottage de 300 ans avec 3 chambres et 2 salles de bains pour 8 personnes, avec lit d'enfant. Grands jardins avec piscine chauffée, nombreux jeux pour l'extérieur, balançoires et trampoline. Grande cuisine entièrement équipée avec tous les appareils les plus modernes. Salon spacieux et confortable avec de la télévision par satellite en anglais, DVD et magnétoscope, Wifi et Hifi, beaucoup de sièges et cheminée. Patio couvert, avec des tables, des chaises et barbecue. Salle de bains attenante à la chambre 1 avec douche, lavabo et toilette. Salle de bains familiale avec douche, lavabo et toilette. Chauffage et électricité inclus dans le tarif de la location. Les bûches sont inclus. Le chauffage central est disponible sur demande, coût supplémentaire. Completely equipped, cosy cottage, Friendly owners. We had a lovely stay at La Basse Lande. The Gite was so well equipped, comfortable, clean and very cosy. The Owners on site were welcoming very friendly and helpful with good local information. To swim in the pool and enjoy the garden was very relaxing. Lovely holiday, lovely location and indeed a holiday choice to be repeated. This house was well equipped and Jane and Nigel were very helpful. We were group of eight (four adults and four children). It was spacious, with a lovely heated pool which our children enjoyed most of the days. Jane was very helpful in getting our provisions as we went in a Sunday. They suggested lot of nearby attractions which were really lovely. Thanks Jane and Nigel for the great place. Jane and Nigel were excellent hosts. Communications up to the visit were spot on with full directions provided to find the property etc. We travelled light and Jane and Nigel made sure there was everything we needed. There was plenty of games available to amuse the kids and the young ones enjoyed the rural location including feeding the chickens! All in all a very good time was had by all and I would highly recommend a visit to this lovely property. Many thanks for your kind words. It was lovely meeting the 3 generations of family and we would be very pleased to welcome you back to La Basse Lande in the future. 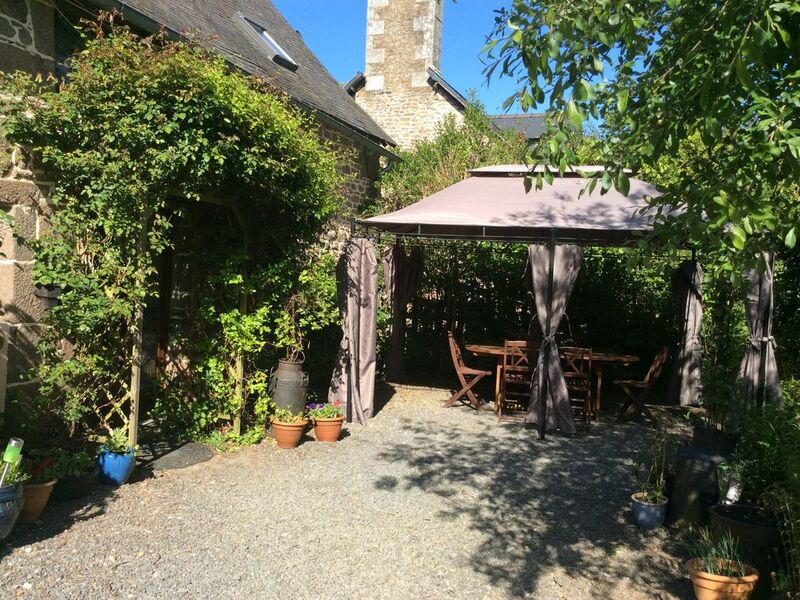 A super base for seeing Brittany and Normandie with helpful and charming hosts and a well equipped home from home. Have stayed here four times now all have been fantastic. Jane and Nigel cannot be more accommodating. Well equipped gite beautiful surroundings. It was lovely to welcome you back yet again this year. A bit quieter without the boys but looking forward to catching up with you all in 2018 for your fifth visit. Great relaxing holiday with family and friends. The property is lovely and very well equipped, as soon as we arrived it felt like home from home with all you could need plus more. We didn't need to bring much as everything was provided including beach and towels etc. A real bonus when you are aiming to pack light without a roof box! Also Jane was very kind to buy our basics!! The "swimming pool" was one of the highlights of the holiday!!! fabulously clean, with lots of inflatables and comfortable sun loungers for the adults and a plus side is the place is very safe for the children as the access to the property was closed off with an electric gate so the children where able to wonder around enjoying the gardens etc.